Thermometers for nearly all domestic, commercial, or industrial uses fall into two broad categories: digital and analog. There are, in general, three classes of sensors that produce signals which can be converted into a digital temperature read-out: thermistors; platinum resistance thermometers; and thermocouples. (For more information on each, click on the name.) Each sensor type exploits a slightly different aspect of a well-characterized interaction between temperature and electrical resistance or induced voltage in certain materials. 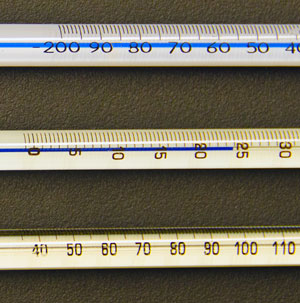 The term "thermometer," when used in the context of digital equipment, refers to electronic systems that capture signals from the sensors, convert them into temperatures using conversion metrics compatible with ASTM and/or ITS-90 standards, and then display the result in some format. 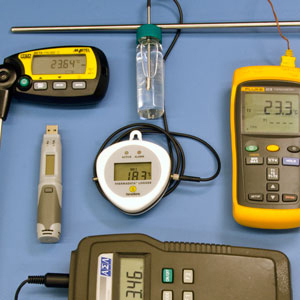 The accuracy of digital thermometers thus depends on sensor type, sensor quality, calibration, and adherence to specified standards, as well as thermometer electronics and conversion scheme. Measurements can be displayed in a variety of formats, data from multiple units can be shown simultaneously, and all results can be recorded with a time-stamp for creating graphs to view data trends over time. Analog "bulb" thermometers use mercury or an organic fluid such as alcohol, kerosene, toluene or some proprietary liquid. All those substances have one thing in common: They expand (contract) to a well-documented extent in response to increased (decreased) temperature. The change in fluid volume alters the height of a column of the fluid in a closed glass container, and the temperature is read from graduated marks on the container. Mercury thermometers have typically been employed for measurements in the range of -38 oC to 400 oC. Similar liquid-in-glass designs employing an organic fluid can have a range of -196 oC to 150 oC, depending on the fluid properties. "Out of the box" accuracy for such devices is generally about one scale division. Users considering the use of a liquid-in-glass thermometer should consult the relevant ASTM standards: E1 and E2251. 2010- present. NIST stopped calibrating Hg thermometers on March 1, 2011, but has continued an active education and outreach program to assist in the transition away from mercury. ASTM International, which encourages and supports standards for industry, has several active projects in its Mercury Removal Initiative, including an ongoing program for the petroleum and lubricants sector (covered by ASTM's Committee D02). At the same time, United Nations Environmental Programme has strengthened the framework of its Global Mercury Partnership. Environmental Protection Agency (EPA) -- EPA hosted meetings in the Spring of 2008 to discuss strategies to eliminate the use of mercury thermometers in EPA regulations and laboratories. NIST provided technical guidance documents, presentations, and technical advice as experts in temperature measurements. Clinical Laboratory and Standards Institute (CLSI) -- THG staff worked with CLSI staff to update standards calling for the use of mercury-in-glass thermometers, enabling laboratories to use other thermometer types with NIST traceability. Centers for Disease Control and Prevention (CDC) -- Control of temperature is critical to proper storage of vaccines in order to preserve safety and efficacy. At CDC's invitation, the NIST THG gave a presentation at the May, 2008 "Vaccine University" sponsored by CDC. Over 60 participants learned how traceable temperature measurement and control can be achieved with modern electronic thermometers. These activities built on support provided in 2007 to the Food and Drug Administration (concerning steam processing of food) and ASTM's Committee D02. 2005-2008. In 2005, two NIST researchers authored a landmark paper in the Journal of ASTM International that laid out the main considerations in alternative thermometry. Two years later, NIST had begun its mercury-reduction campaign. For questions about information on this website, click here.